The Jury-System is a web application operated as Software as a Service (SaaS) — an internet connection is all the infrastructure you need! Clients subscribe to the system and get their own subdomain of jury-system.com that is a fully customized, SSL encrypted (https) website set up to make juries and auditions as easy as possible on all participants. Questions? Contact us either online or toll-free at 844-NoPaper. We create a secure subdomain for each client, such as https://your-school.jury-system.com and make that the starting point for your system. We prepare repertoire record and evaluation forms to client's specifications - each client can have as many different versions of each as needed. We set up exam or audition schedules and signup forms as desired by the client, including number of slots, length of slots, starting and ending times, break times, dates, etc. We administer user accounts, granting faculty access to those designated by the client. Login credentials can be created from scratch or subscribers may choose to integrate it with an institutional Single Sign-On system. 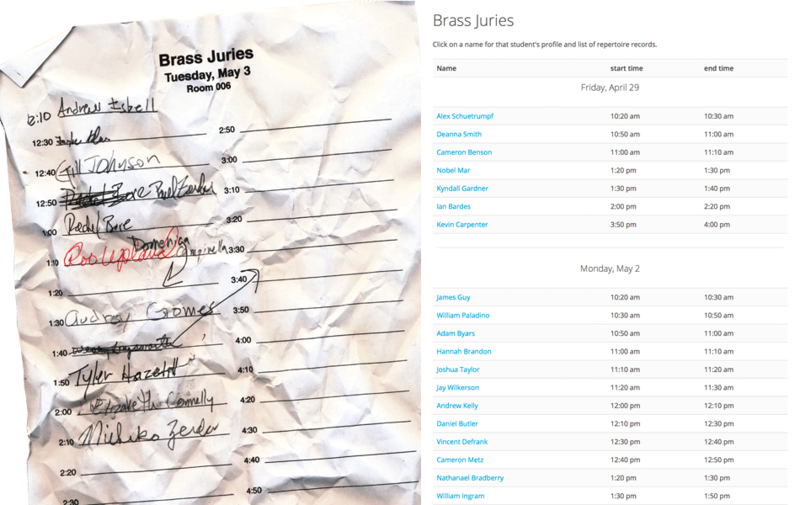 Students schedule their jury exams and create repertoire records on the website. Jury members click on a student's name in the schedule to open the repertoire record and an evaluation form. Jury comments and grading are done on a laptop or tablet and results are emailed to the student and his or her teacher, or any other addresses as desired. Frequently used comments can be stored for each jury member and inserted into an evaluation with a single click. Musical symbols and for vocalists, IPA symbols, can be inserted into the evaluation forms. Results are also stored in the website database and can be exported in a variety of formats if desired.